Sometimes one decision can completely change your outlook on life and love. This is exemplified in "The Bungalow," Sarah Jio's latest novel. Anne Calloway has the life of luxury, living in wealth (with a maid!) and engaged to a prosperous banker who adores her. With one decision, her perspective on life changes completely. Instead of getting married right away, she chooses to become an army nurse in the South Pacific, facing grueling heat and gruesome injuries. Then she meets Westry, and begins to question everything she knows about love. They spend time together in an abandoned bungalow until the night they witness a tragic event. Soon after, even more changes threaten their love and the course of their lives. While this was a beautifully told story, there are some things that nagged at me. I will say this over and over again...I have a hard time supporting a character that is cheating on their significant other. It makes me feel guilty by association. In Anne's case, her fiancée was really sweet and completely doted on her. He was also gorgeous and wealthy. Most girls would have jumped at the chance to be engaged to such a catch! However, Anne seems to forget this as soon as she travels far away from him. Oddly enough, the story has a "Titanic" feel...being in a new and potentially dangerous situation and finding a possible soulmate as a result. However, while I cheered on Rose and Jack (because Rose's significant other was a complete jerk), I had a hard time mustering up the same enthusiasm for Anne to be with Westry. Also, some of the small world connections throughout the story seemed a bit far-fetched. If you have a good amount of "suspension of disbelief," it's enjoyable to see the connections take place. Aside from that, there was a curse associated with the bungalow that was mentioned throughout the story and I would have liked more background into what caused it. Almost like a story within a story, if possible. Even so, the story was so well told that it was hard to not get emotionally involved on some level or another. Eventually, I did feel bad for Anne because of the situation she got herself into. She tried so hard to be a good person aside from the unfaithfulness issue. 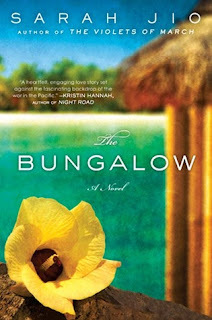 Overall, I really liked "The Bungalow" and have a feeling it will be staying with me for a long time to come. (If anything, Anne and Westry will just keep sending me signs in the strangest places, such as the placement of those lovely hibiscus flowers on one of my favorite television programs). I've already been recommending it to everyone I know and I am eagerly awaiting the release of Ms. Jio's next novel. Thanks to Penguin Books for sending me an advanced copy in exchange for an honest review. They will also be giving away some copies when Sarah comes to visit on her publication day!